In the Assyrian inscriptions Anu is coupled with Dagan, “the exalted one,” whose female consort seems to have been Dalas or Salas. Here Dagan or Dagon is associated with Harran, the half-way house, as it were, between the Semites of Babylonia and the Semites of the west. From Harran we can trace his name and cult to Phoenicia. Beth-Dagon was a city of Asher, in the neighbourhood of Tyre and Zidon (Joshua xix. 27), and the fragments of Philôn Byblios, the Greek translator of the Phoenician writer Sankhuniathon, tell us expressly that Dagon was a Phoenician god. That the statement is genuine is made clear by the false etymology assigned to the name, from the Semitic dâgân, “corn.” But it was among the Philistines in the extreme south of Palestine that the worship of Dagon attained its chief importance. Here he appears to have been exalted into a Baal, and to have become the supreme deity of the confederate Philistine towns. We hear of his temples at Gaza (Joshua xvi. 21-30) and at Ashdod (1 Samuel v. 1 sp. ), as well as of a town of Beth-Dagon, and we gather from the account given of his image that he was represented as a man with head and hands. 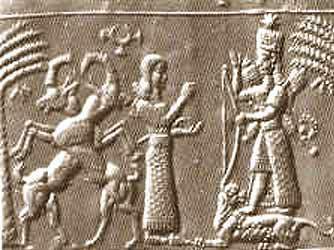 The goddess Ishtar, wearing the horned headdress of divinity, with spears and maces on her back. The goddess is winged, and stands with her foot upon a lion, her sacred animal. It is probable that the worship of Anu migrated westward along with the worship of Istar. The god and goddess of Erech could not well be dissociated from one another, and the spread of the worship of the goddess among the Semitic tribes brought with it the spread of the worship of the god also. Detail of the goddess Ishtar. From a cylinder seal in the British Museum. I am inclined to think that this must be placed at least as early as the age of Sargon of Accad. The worship of Istar found its way to all the branches of the Semitic family except the Arabic; and, as we shall see in a future Lecture, the form of the name Ashtoreth, given to the goddess in Canaan, raises a presumption that this was due, not to the campaigns of the early Babylonian kings, but to the still earlier migrations of the Semitic population towards the west. Ishtar, goddess of sexuality and warfare. She appears frequently on seals, relief carvings, and in descriptions as a mighty warrior who protects the king. 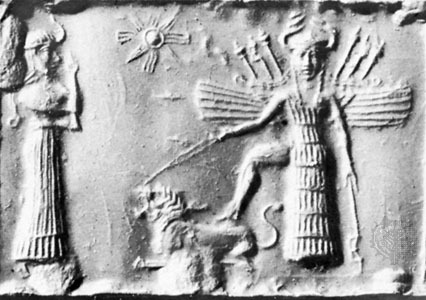 Ishtar was associated at an early period with the Sumerian goddess Inanna and both deities are depicted with symbols of fertility, such as the date palm, and of aggression, such as the lion. This iconography survived relatively unchanged for over a thousand years. Here, Ishtar’s astral quality is also emphasized: above her crown is a representation of the planet Venus. In the first millennium BC more unusual stones were used to make seals: this one is made of green garnet, which may have come from northern Pakistan. British Museum, ME 89769, acquired 1835. The old sky-god of the Accadians must have become the Semitic Anu at a very remote period indeed. But it was the sky-god of Erech only. It does not follow that where the divine Ana, or “sky,” is mentioned in the Accadian texts, the god who became the Semitic Anu is referred to, even though the Semitic translators of the texts imagined that such was the case. There were numerous temples in Chaldea into whose names the name of the deified sky entered, but in most cases this deified sky was not the sky-god of Erech. It is only where the names have been given in Semitic times, or where the Accadian texts are the production of Semitic literati composing in the sacred language of the priests, like the monks of the Middle Ages, that we may see the Anu of the mythological tablets. A.H. Sayce, Lectures on the Origin and Growth of Religion as Illustrated by the Religion of the Ancient Babylonians, 5th ed., London, 1898, pp. 188-90.